Tradition was bred at Germany’s Hüll Hop Research Center for a noble aromatic profile but with improved resistance to disease and fungus vs. the landrace varieties; its parentage is predominantly Hallertau Mittelfrüh, with Saaz and Hallertau Gold in on the horticultural action. I always get a mix of typically Hallertau-ish sweetness with earthy, herbal pungence out of Tradition cones – hay, sweetgrass, basil, clover honey. Its low cohumulone and high humulene content (35-50% of total oils) makes it a good late addition hop; its higher-than-landrace-varieties alpha acid level (6.5% on my bag) makes it good for bittering these restrained Bavarian lagers. I like to split the difference and use it during wort collection for first wort hop additions. Having just come into a big pound of whole Tradition, and a full sack of Weyermann Munich I, it can only be Dunkel time. As of Day 12, it’s a point or two above TG, diacetyl negative, and already pretty bright – gonna give it just a bit more settling time, then keg and carb for super-fresh, Kellerbier-style outdoor Maßkrüge action while spring is still figuring out how to get properly underway. 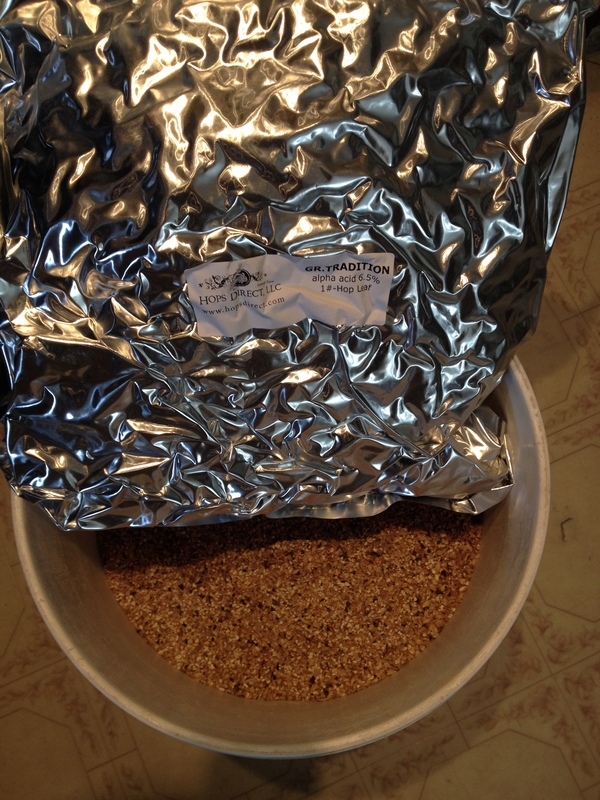 This entry was posted in homebrew and tagged all-grain, decoction mashing, first wort hopping, German beer, lager, lager brewing, mash schedules, Munich Dunkel, techniques, Tradition by MD. Bookmark the permalink. Welcome back, Dawson. Though in your own world you never went anywhere, I’ve personally missed not only reading about your brews but also your writing style in general. Very informative and entertaining. 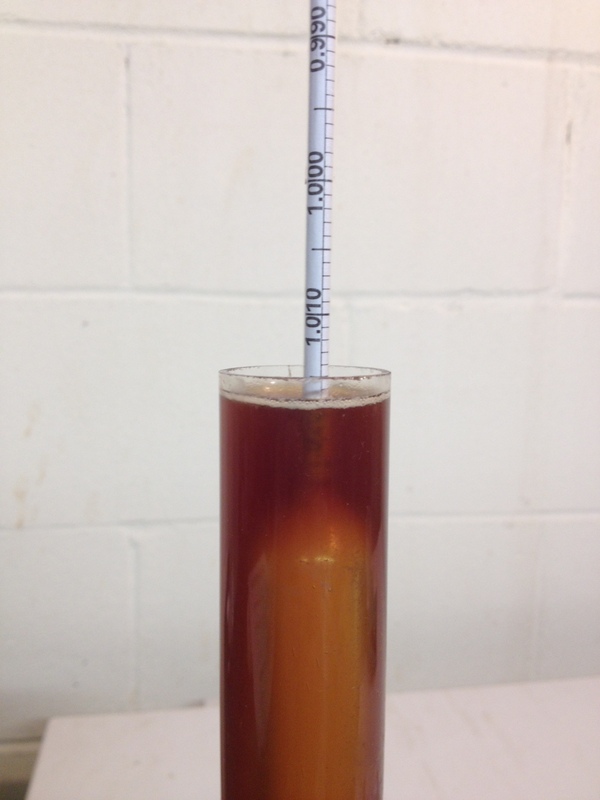 I also recently brewed a more Helles oriented Kellerbier using WLP833. At day 6 in primary its almost near target gravity and is already delicious. I owe you and Urban Chestnut (Zwickel) for getting me into unlagered lagers. Thanks and Cheers! Glad to see a beer truly brewed the hard way turn out. As for me, I somehow managed to make an acetaldehyde bomb of a cream ale. Win some, lose some, eh? I wish more breweries would brew beers like this. Dunkel is one of those things that I get really excited about. Only option on the shelf is Hofbrau and its pasteurized and usually stale as can be. Around here I’m lucky to get Hacker-Pschorr and Ayinger that usually isn’t too beat up; there are some good domestic craft brewed Dunkels to be had out there too – Chuckanut, Prost, and Heater Allen all brew ones that I enjoy. But yes, everybody should brew more Dunkel. Dunkel looks nice but what I really want to know is what goes in that hot scotchy? Chris and Kurt have a better memory than I do … but yes, it’s first runnings of the unhopped wort plus Scotch; in this particular case it was Dunkel wort and Highland Park 12. It’s from Brewing Big Beers, right? The parti-gyle episode. I believe you’re correct. Being a bit of a cold weather pansy, I was in awe of the AG brewing in the freezing cold. The hot scotchy just put it over the top. I’ve always loved a Dunkel! One of the best beers I had while stationed in Germany! My questions are, what’s your water to grain ratio for the mash? Does it make any difference to have a rest at 95F since you’re going straight to 136F? The water:grist ratio for this batch was pretty close to 2 qts/lb – mash thickness is pretty dilute to allow enough enzymes to remain in the thin mash while the deoction portions are removed and boiled. The 95F acid rest is mainly for a very specific set of conditions (adjusting mash pH without salts when using pale base malts and very soft water), so didn’t use it here. Have you ever read this blog? http://brulosophy.com/methods/lager-method/ He writes about an interesting alternative to the traditional lager fermentation method and I’d love to hear your thoughts on it. I always liked Munich kellerbier for spring. There’s some itch an ale can’t scratch for me in the warm months. Michael, do you think you will ever publish a brewing book?? Love the way you write, humour is awesome.. I think you could be to Brewing ,what Aaron Franklin is to Barbeque .. We need more of your words on the page, Please.. More GROWLER , TMBR although the T should stand for Ten and more CHOP & BREW. They brighten my day, and as the nights start to draw in , we need that !! Love a good dunkle. Your comment about domestic or local dunkles is timely. A while back I had Lakefront Brewing dunkle, and they were kind enough to share the recipe. That’s a very enjoyable beer. Here in Kansas City, the KC Bier company produces an absolutely stunning dunkle that is every bit as good as anything from the old country. This post reminds me that I need to brew one up. Missing Michael… Would love to see a Kolsch recipe that I can get brewed by the end of January and lager until Memorial Day. Citizens, today we tip our caps and sadly remember the anniversary of MD’s last beerengine post. Brew on dear brother, and blog if you can! Michael, I just watched Don O’s interview/video with you. In the interview you said that you would possibly be posting on the beer engine again. I am here to say that I (and I think everyone here) think that’s a great idea. I am an avid follower/reader of your home brewing exploits and have really been missing the blog in my life in the past year or so since you last posted. The book is amazing and I can’t wait to brew and discuss the recipes that I try out on the blog. Anyways, I don’t normally comment or post. So, I thought that bringing my voice to the table would maybe give you some motivation or even just leave room for discourse among home brewing aficionados. Cheers and thanks for all you do.